Register Log In Texas Hunting Forum Forums Recipes & Cooking - Cleaning & Preparation Homemade Margarita's on the rocks! This recipe is too good not to share. I have been making these for years and wanted to pass it on. These margarita's on the rocks are the best I have ever had. To make them, it is equal parts for measurements. I normally use a double shot glass for measuring. For example, 1.5 means 1 and a half pour in my double shot glass. 3/4 means three quarters full in my double shot glass. You can use any measurement cup, as long as you keep the units consistent. Pour into something you can shake up. Pour contents into a cocktail shaker or pitcher with a little ice. Shake up and serve over ice. Salt optional! To make simple syrup, make equal parts of water to sugar. 1.5 cups of boiling water to 1.5 cups of sugar. Stir constantly until fully dissolved (about 2-3 minutes) and chill. 1.5 cups of simple syrup will make 2+ drinks. 2 cups will make 4+ drinks. I use Jose Quervo silver 1800 tequila and this Agave nectar pictured below. Any high quality silver tequila will work well. Gonna try this, my brides fav. Man that does sound good, have not had a good one in Wolf Brand Chili long. I have made these by the pitcher on the tail gate at Jimmy Buffet measuring these out to the exact amounts in a cowboy hat, Hawaiian shirt and flip flops. It's a crowd favorite! I made some Saturday night, and they were absolutely awesome! 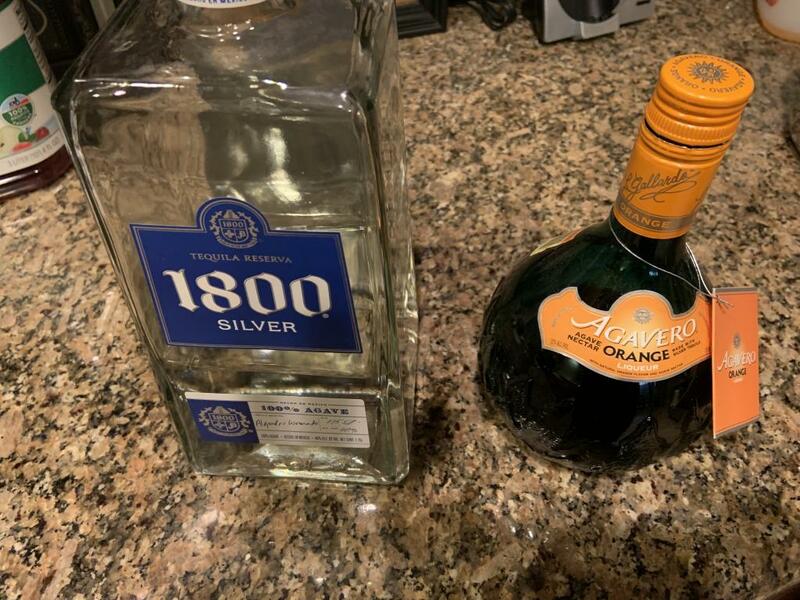 Get a high end silver Tequila and that exact Orange liquor Agave Nectar I have pictured. The Orange liquor is what makes the drink, IMO. I have god friends Jim & Roz Welch that go to the Jimmy Buffett every year, one of these days I will make it. Last batch I made was with frozen lime aid.